We offer a wide range of Hot & Cold Rolling Machine, manufactured as per the international standards. Using the advanced manufacturing process and facilities, we develop our Hot And Cold Rolling Machine, which also undergo metallurgical inspection for their accurate and precision working. 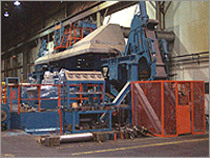 Developed by experts, our Hot and Cold Rolling Machine reduces the scrap and ensure easy operation. The Hot Rolling Machine produces thinner cross sections and reduces the average grain size of a metal, while maintaining an equipped micro structure. With right blend of technology and experience, we successfully customize Hot and Cold Rolling Machine as per the clientâ��s specifications at reasonable prices.